Over the years, I’ve learned to appreciate the beauty of simplicity. This principle can apply to every facet of your life, including personal finance and investing. Keeping it simple when it comes to investing can include making savings for investing purposes automatic (via preauthorized debit transactions) and keeping your portfolio as lazy as possible (using low-cost indexed funds). Although simple often works when it comes to investing, this doesn’t make it easy. There is some discipline involved to manage every investment portfolio. As my friend Andrew Hallam nicely puts it in in his popular book Millionaire Teacher, you need to collar your inner doppelganger to experience greater investing success. Thanks to the financial technology (fintech) revolution, a new online financial advisor service is available to help you conquer that investment enemy in the mirror: ModernAdvisor. In the past, I profiled another online investment service on my site (Wealthsimple). Today’s post will take a closer look at ModernAdvisor with thanks going out to Navid Boostani, co-founder and CEO of this firm. Navid, thanks for this interview. Thank you for taking the time to speak with me, Mark. Navid, it seems the future is now. Robo-advisor firms, computer algorithms managing our portfolios, that’s no longer science-fiction. Could you share the genesis of ModernAdvisor with readers? Absolutely Mark. Before starting ModernAdvisor I was working as an independent advisor. During that time, I came across a number of frustrating issues within the industry that I decided to tackle by launching ModernAdvisor. One of the biggest issues, and something that I know you’ve talked about at length, is the high fees Canadians pay for access to managed investment products. The average mutual fund costs approximately 2.40% per year. What bothered me even more was the prevalent lack of transparency. It’s quite shocking how the industry has gotten away with charging clients tens of thousands of dollars in fees in most cases without the clients’ knowledge. So we didn’t really set out to launch a robo-advisory business. We set out to solve real problems in the investment management industry. Given my background in engineering I knew the solution would have to use modern technologies to be successful. There are a number of fintech firms now. What makes ModernAdvisor special? Fintech is a very broad term and could refer to a range of businesses including mobile payments, peer-to-peer lending, expense tracking apps, and robo-advisors. At ModernAdvisor we deliver a world-class investment management service at an aggressively low-cost. You’re likely to see us offer some financial planning tools to our clients as well, but our main focus will always be making sure we provide a best of breed investment management service. We also set ourselves apart by making sure every client – regardless of the size of their account – receives great and quick service. We have internal metrics that measure how quickly we respond to client or prospect inquiries and are always willing to go the extra mile to make sure our clients are happy. This might sound counterintuitive for a ‘robo-advisor’, but at the end of the day we are in the service industry, and making sure we offer a first class client experience is paramount to our success. I noticed on your site you call out all investors are CIPF Protected. 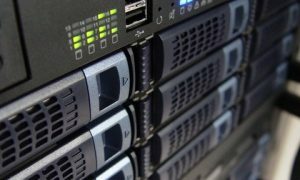 For those that don’t know, what does that mean for investors using your services? We hold our client accounts under their name at Credential Securities. Credential securities are regulated by the Investment Industry Regulatory Organization of Canada (IIROC) and administers over $25 billion in assets for some of the largest credit unions in the country. So the likelihood of them becoming insolvent is very low. But if something were to happen to Credential Securities, the Canadian Investment Protection Fund would ensure our clients get their cash and securities back up to $1,000,000. Let’s say I’m considering ModernAdvisor. Can you walk me through your set-up process? Sure. We’ve spent a lot of time and resources to ensure opening an account is easy and can be done from the comfort of your own home. You can go to our website at modernadvisor.ca and answer a few questions about your investment goals and risk preferences. Based on your answers, our system will recommend an appropriate risk level for your portfolio. We categorize our portfolios into 10 different risk levels. A risk level of 1 indicates a very conservative portfolio suitable for short-term goals. A risk level of 10 indicates an aggressive portfolio that is suitable for clients with long timeframes and who can stomach volatility in their investments. You can also choose between core and socially responsible portfolios and review the projected future returns for your chosen option before finalizing your investment plan. Once you confirm your investment plan, you can use our user-friendly online forms to enter your personal information and digitally sign the account opening documents to open your ModernAdvisor account. To fund your account, you can simply send us an online bill payment. If you are transferring an existing investment account from another firm all you need to do is send us a recent statement, and we will take care of the rest. Canadians are catching on, they are learning high money management fees kill portfolios over time. What does ModernAdvisor cost? You’re absolutely right Mark. I’m really happy to see more Canadians starting to pay attention to the fees they pay. As you noted, investment fees have a very significant impact on portfolio returns over the long-term. In fact, Canadian Center for Policy Alternatives recently published a study that found high mutual fund fees could force Canadians to retire 11 years later, or have up to 40% less in retirement. So this is an issue that cannot be overemphasized. With ModernAdvisor, there are no admin, trading, or account maintenance costs. Clients pay a small, transparent management fee which is 0.50% per year for accounts under $100,000, 0.40% for accounts between $100,000 and $500,000, and 0.35% for accounts over $500,000. For accounts under $10,000 we have a minimum fee of $49/year – but we waive the minimum fee for clients who are building their savings and deposit at least $1,500/year in their account. The only other fee clients pay are the embedded cost of ETFs, which for our core portfolios range from 0.12% to 0.22% depending on the risk level. How do your fees compare with other robo-advisory firms? Wealthsimple? Nest Wealth? Others? We’re definitely one of the lowest-cost, if not the lowest cost option in Canada depending on the size of client’s account. Management fees are easy to compare – and we match Wealthsimple for most account sizes on management fees. For accounts between $100,000 and $250,000 our management fees are actually lower than Wealthsimple. Comparing the embedded cost of ETFs is a little bit less straightforward. For one, firms are likely to change the composition of their portfolios from time to time which makes a timely comparison difficult. Some firms also use what I call exotic ETFs which might have hidden costs in addition to the management expense ratio (MER) that is publicly available. For example, Wealthsimple includes Purpose Duration Hedged Real Estate Fund in their portfolios. This ETF has a trading expense ratio (TER) of 0.26% per year – but that number doesn’t show up in the MER, or any of the fee comparisons. 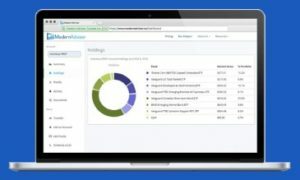 Do ModernAdvisor team members use ModernAdvisor for their own portfolio management? What a great question, Mark. I think anyone interviewing an investment advisor – traditional or online – should ask whether the advisor invests their family’s money in the same funds as they recommend to their other clients. We absolutely put our money where our mouth is. Almost every one of our team members – including ex-employees who left to pursue other opportunities – invest with ModernAdvisor. As for the founding team, not only I have my own RRSP and TFSA with ModernAdvisor, my wife, sister, and aunt all have a significant portion of their investments managed by us. The same is also true for my co-founder, Adrian, and his family. Where can investors learn more? The best place to learn more is our website at www.modernadvisor.ca. We have a list of frequently asked questions and answers on our FAQ page. We are available via live chat, phone, or email to answer questions if you can’t find what you are looking for online. Also, to really get a good sense of how ModernAdvisor works you can open a 30-day risk-free trial account. We will fund your trial account with $1,000 of our own money and invest it according to your investment plan. As a bonus, clients who open and fund a real account following their trial can keep any gains that might have accrued in their trial account. Mark: thanks for this Navid. It’s great to see hear about more transparency and passion to help Canadian investors. On that note, I am pleased to announce my partnership with ModernAdvisor. Going-forward, you’ll see ModernAdvisor listed as a partner on my site for many of the reasons Navid wrote about and what I’m passionate about; helping investors fight high fees, learn how to invest better and tame their inner investor doppelganger. Try ModernAdvisor risk-free for 30 days with a trial account funded with $1,000 of ModernAdvisor’s money. Yes, you read that correctly. At the end of your trial period you can keep any gains if you open and fund a new ModernAdvisor account. With this partnership, My Own Advisor readers will also get a $50 bonus when they open and fund a new ModernAdvisor account (yours truly will earn a small thank-you bonus for referring you). Smarter AND better investing choices for Canadians have arrived. Fight high fees, learn how to invest better and keep more of your hard earned money. 10 Responses to "Hassle-free investing is here with ModernAdvisor"
Curious to know if Modern Advisor supports RDSP accounts? Young and Thrifty’s Complete Guide to Canada’s Robo Advisors listed WealthBar as the only RA that allows RDSP accounts. You know, that’s a good question Yash. I can forward your email and questions to Navid and his team for you. Navid might be following this article as well. Checked their FAQ and it lists RRSP/TFSA but no RDSP. Hopefully RAs can figure out how to incorporate RDSPs as there is (potentially) a solid market for it as the RDSP appears to be underutilized as-is. Personally I’d rather have a RoboAdvisor do the work rather than do it myself. I would think eligible adults/children & their parents would prefer an automated method as well. If Navid’s following, hopefully he’ll respond. I didn’t see anything on their FAQs either. I will forward your comments to him Yash. Stay tuned! Navid went on to say “we will do our best to add RDSPs as soon as possible. Feel free to reach out to Navid or his team with any questions. In the interest of full disclosure – did you receive any monetary compensation (any compensation for that matter) for posting this story to your blog? You can also read my Partners page for more details. Not to knock ModernAdvisor or any of the new companies out there offering another solution to investing, but if you dig into the numbers they are basically on par with what the big banks offer in terms of cost. Yes, the big banks do have high fees on the vast majority of their funds but they do have index funds that are substantially cheaper. 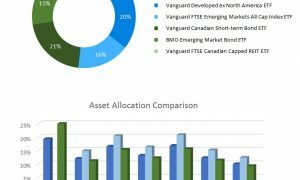 Say you had $100k or less to invest and wanted a build a basic 4 fund portfolio to get exposure to bonds, Canadian equity, US equity and international equity. With ModernAdvisor it’ll cost you about .65% in fees (.5% for their fee and .15% for the ETFs). With RBC you can build the same portfolio and it’ll cost you about .7% in fees through their index funds. That is only a savings of .05% which is peanuts in the grand scheme of things. As your portfolio grows to over $100k, you’ll be looking at investing in ETFs anyways and all the discount brokers and banks offer reasonable fees that reduce the cost on an all ETF portfolio to only the MER. I have debated switching banks or opening multiple accounts with other establishments to cut down costs as I’ve grown my portfolio into the six figure range. Throughout the process I’ve always stayed with my bank though because of the simplicity of having everything in one place. Fintech is a good thing and the new institutions are good for competition but I think the banks are being over looked as they already have cheaper options that are readily available to an informed customer. Nothing to knock, I welcome all criticisms and applause – regardless of the subject. I think ModernAdvisor (along with other Robo-Advisor and FinTech companies; I just so happen to have established a great partnership with ModernAdvisor and I believe in their services) have filled an important niche for investors. This is by no means the only way to invest or company to invest with. It is however a good fit for people struggling to understand fees and get some low-cost, but important and much needed advice. There is nothing wrong with staying with your current bank – if they provide value. I’m not suggesting people ever switch what is working for them. If however, ModernAdvisor and other Fintech firms can help some folks better understand their fee structure; help their investing behaviour; simplify their financial life – then this is a very, very good thing and I’m happy to share and spread the word. These companies are opening up opportunities and competition and that’s good for the consumer.